Game Design is a popular major here at University of Wisconsin-Stout, but some students like to code regardless of whether or not it’s for a class. Such is the case with Jaden Schneider, a freshman computer science major who’s taking things entirely into his own hands and making a game from scratch. It all started back in early February when Schneider rediscovered some long-lost ideas for a platforming game. “I came across my docs for an old VR game idea I had from I dunno when and thought it would make a cool PC game. It was literally just a bunch of notes, so I basically started from scratch making this version,” he explained. Schneider’s original concept was to create a vertically-oriented experience in VR with gameplay centered around scaling walls, sneaking past enemies and making your way across treacherous, sky-scraping platforms. 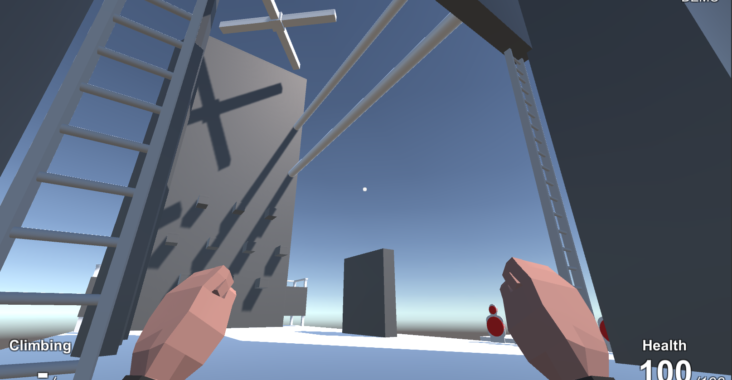 Now, he’s introducing weapons into the mix and creating a first-person shooter. He’s achieving this by using a number of different programs: Visual Studio for code writing, Blender for model building and Unity 3D to combine all his assets into a playable, visual format. Almost all first-person shooter (FPS) games are linear with up-and-down movement being very limited, but Schneider is turning that tradition on its head with his unique idea. With visuals reminiscent of classic Nintendo 64 games and a wide array of guns, the currently unnamed project will be one of the first non-linear FPS’s since LawBreakers in 2017. Due to how early it is in the entire game-making process, Schneider said that he didn’t have a concrete idea yet of when it will be released. He only knows that he’ll be putting it on a handful of popular online game stores, such as Steam or Green Man Gaming, when it does.